Whispers in the Loggia: Hatman: Being Pope "Would Be a Nightmare"
A year ago today saw a Vatican earthquake of sorts as the Pope named one of his closest disciples to head up the all-powerful dicastery overseeing the world's 5,000 bishops. As the appointment made Cardinal Marc Ouellet one of the Roman Curia's "Big Three" and only served to further burnish a unique resume that's taken the Quebecois from Communio articles to Latin American seminaries, a Roman professorship, prominent ecumenical posting and seven years at the helm of Canada's oldest diocese, perhaps the immediate uptick of talk dubbing the Sulpician prelate a leading papabile would've been more conspicuous by its absence. Still, having capped his first year leading the "Thursday table" of the Congregation for Bishops with the move of a fellow member of the pontiff's "kitchen cabinet" to the helm of Europe's largest diocese, the media-friendly cardinal-prefect has gone on the record to address speculation of his odds in a potential Conclave, saying that, for him, being Pope "would be a nightmare." 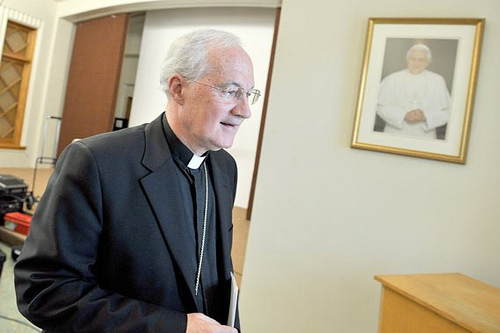 In front-page-inducing (left) comments to Quebec journalists in Rome to cover yesterday's reception of the pallium by his successor, the New England-bred Archbishop Gerald Lacroix, Ouellet said that while "you can't keep the world from dreaming things up," seeing Benedict's workload at close range makes the prospect of the papacy "not very enviable." "It is a crushing responsibility," the cardinal mused. "It's the kind of thing you don't campaign for." Asked about his own years as archbishop of Quebec, the highest-ranking Canadian ever to serve at the Vatican said he could end up in "tears" recalling them. "It is difficult to leave," he said. "I have incredible memories." At the same time, the 67 year-old cardinal defended his penchant for stirring the civic pot in the highly-secularized province, where the cardinal sparked a heated reaction early last year for calling abortion a "moral crime" -- a "small phrase" which, he said at the time, had been "twisted" out of its original context and "created" as "a weapon... to discredit [him]." In retrospect, though, "I did what I had to do," Ouellet remarked yesterday. "I don't regret anything. "I loved the people very much. And when you have to say a difficult truth, even that's an act of love, even if it's hard to accept." 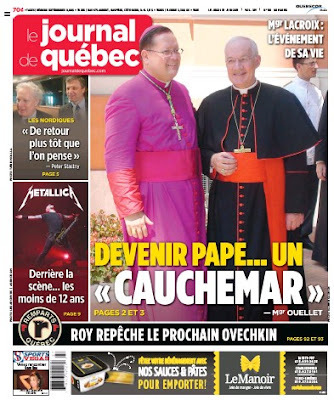 Despite having departed for Rome, the defining word on Quebec's Catholic future lies all the more in Ouellet's hands -- the majority of the region's diocesan bishops are either at or within a few months of the retirement age of 75, led by Cardinal Jean-Claude Turcotte of Montreal, who marked the milestone earlier this week.